Kenji Tomiki was born on the 15th of March, 1900 in Akita Prefecture. His first martial arts training began at the age of 6, when he took up a bokken (wooden Japanese sword), and soon after began studying kendo. At the age of 10, he began his training in Judo. His skills and dedication to training were such that, after being the captain of the Judo Team at Waseda University in Tokyo, he became an uchi-deshi (live-in student) of Jigoro Kano, the founder of Judo. It was through his association with Kano that Tomiki Sensei came to be acquainted with Morihei Ueshiba, the founder of Aikido. In the 1930’s, Tomiki Sensei was awarded a Professorship at Kengoku University, which the occupying Japanese government had set up in Manchuria. Though it is little known outside the martial arts community, Tomiki Sensei was a famous calligrapher. To this day, his brushworks are much sought after by collectors. Knowing that, one will be less surprised to discover that Tomiki was in Manchuria not as a Professor of Budo or Judo or Athletics, but of Calligraphy. He did, however, volunteer himself as the university’s Judo instructor, and made Aiki practice and principles mandatory for all of his students. Kenji Tomiki’s style of Aikido is a style that strives to combine the competitive excitement of Judo with the spiritual serenity of traditional Aikido. 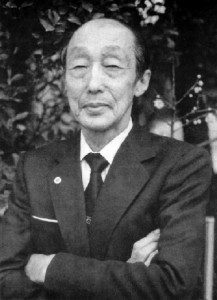 Kenji Tomiki (1900-1979) was perhaps more suited than anyone else in history to combine the disciplines of Judo and Aikido; during the 1920′s and 1930′s he studied intensively with both Jigoro Kano, the founder of modern Judo, and with Morihei Ueshiba, the founder of Aikido. Kenji Tomiki earned the rank of 8th Dan in both Judo and Aikido.